I recently had the pleasure of taking a group of designers to the New York studio of the Danish architecture firm, Bjarke Ingels Group (BIG). The parallels drawn from this experience outline a set of actions which we as artists might apply to the creative process, and help draw deeper connections and meaning to our daily practice. The idea behind the visit was two-fold: to inspire and invigorate our team by examining processes outside of, but not foreign to, our own methods, and to distill their formula for constant evolution. Apart from their work being of the highest quality, they have struck upon a universal-- that is, translatable-- formula that fosters evolution, and simultaneously sustains them in a genuine process. Most of our designers came from a live tv industry environment; our outstanding mark was speed of production, while quality of execution often suffered in necessity to time. All were more than capable of polished work, but long form projects were rare, and seizing opportunities to lend meaning to such a fast-paced environment is crucial to avoiding burnout. We needed a 'sustainable' approach to our own daily practice. Analyzing techniques and processes outside of our own methods engages abstract thought, and grants license to retranslate ideas in original ways; to reinterpret, modify and problem-solve with custom toolsets. Making connections to these sister art forms not only lends meaning to our own process, but also elevates the potential for cohesiveness and impact in collaborative environments. It's not so direct as examining other designers within our industry, and as a result rejects the mold, infusing definitions of our own process with creativity and meaning. While BIG must be emphatically accredited as the impetus for this creative process comparison, their ideas and techniques are relevant to the creation of all art forms, and-- while the most important qualities of all art forms lie beyond language, we can use this medium to define the common denominators, helping to see us a bit more passionately through our next creative endeavor. The following ideas can be used as tools to help break down walls in pursuit of evolution. ... I'll attempt to address each idea unto itself in forthcoming posts. A glimpse into Frankenthaler’s process reveals that what appears so effortlessly improvised is in fact the result of repeated trials, each one zeroing in on the mark. Her great images weren’t always first attempts, but often the reward of focused problem-solving through thoughtful variation. Frankenthaler’s method demanded that this versioning take place– an image couldn’t just be painted over and retain its pure message. More often than not I think this same process of iterating propels anyone in any field. Too often we keep ideas in our heads, where they remain unedited or mere cells of unwritten motives. In the design process, rarely if ever is a first version of anything the strongest. Maybe close… but throwing ideas out in front of us allows unforeseen possibilities to inform the work, and encourages the kind of flexibility required to create and communicate what moves us. It also has a way of throwing us almost unwittingly into the next project… We naturally evolve and produce, because some tiny cell, discarded for one problem, might be the germ of the next idea. 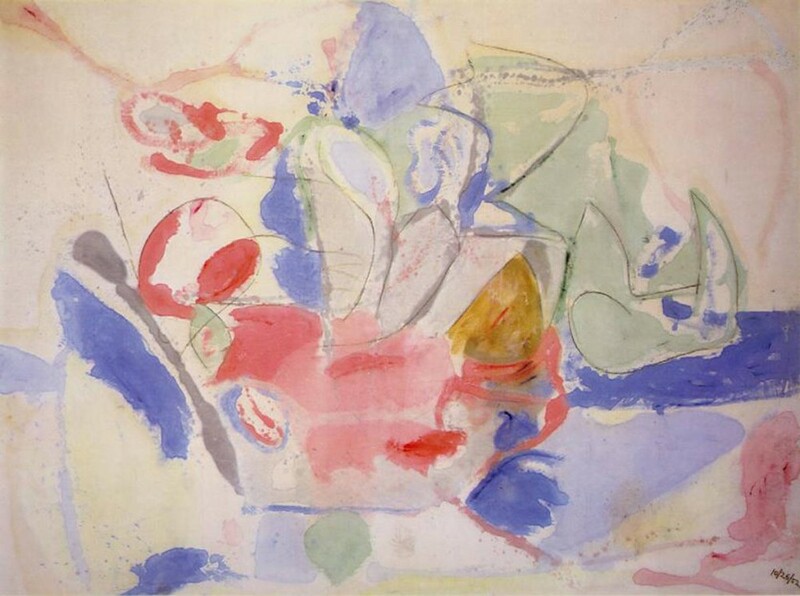 What I love about seeing this intimate, free admission of process from an artist of Frankenthaler’s importance is that she resigned herself to working her gifts, unabashedly… Like so many heroes, she experimented relentlessly, playing not only with ideas and intention but equally stretching the physical limitations of her craft. She wasn’t afraid to miss the mark, because the process of nearing it was as much the point as the tangible product. Pursuit of the right questions and willingness to enter uncharted territory inevitably elevated her work– and where iterations exist to be compared, the growth of an image can literally be charted. Translating and expressing what is– not merely assumed shapes or half-memorized lines– draws the essence out of things. To look, and to begin to understand relationships between objects– to compose, edit, push, pull, and correct marks begins to tell a story, becomes a pathway to travel through and across. One which communicates felt experience. Re-evaluating strengthens a drawing, each line and layer taken away and shifted leaving something of itself behind, a ghosted history which inevitably adds depth to the image. Always the chance to improve if we remain willing to let it all go… willing to wipe the page down and start again, even when some element of beauty has to be sacrificed to get it right. Always something of the previous struggle informing and strengthening the next mark. Confidence and strength of execution exists when detaching from the known. There is more accuracy and beauty in the abstract — more truth in the found, traveled, and discovered — than in the assumed. Inspired by Bjarke Ingels’ talk at MoMA’s Talk to Me Symposium. By accepting the power of evolution, we detach from arrogance, “minimizing the importance of self” (a favorite mantra of my dad’s) in the creation process. The ‘pursuit of originality’ distilled is service– contribution to an infinite process much larger and far more potent than individual potential. If we see our roles as participants in a world of influences, here to push boundaries, we are free to branch out, anchored and expedited by lessons of the past. The title of this exhibit brings to mind a phrase of sustainable architect, Bjarke Ingels, who’s coined “architectural alchemy” as the possibility of creating gold by combining traditional elements. Difficult passages of music are mastered through examination and repetition of parts… By defining manageable components, and breaking down something daunting to perform into a kind of reverse assembly line of notes and inflection. Repetition, muscle memory, and anticipation serve to eliminate complexity. In this distillation there is no difficult vs. easy passage… there is only the examination of parts; the defining of components which can be managed. This processing removes insecurity, and shifts focus from the self to the simple execution of parts. An idea is transformed from abstract to concrete as phrases gradually re-contextualize… and, ironically and beautifully, we come closer to delivering on the composers’ intent when we take our own fear of failure out of the equation. Extraction has a more active connotation than abstraction; purifying rather than muddying or concealing. Dove wasn’t seeking after style, but arriving at style as a product of distillation and describing the felt essence of his subjects. He wasn’t striving for originality, but describing a genuine perception of things while layering upon his contemporary influences (Matisse– and fellow 291 artists). So– the significance and practical application here can be understanding the rewards of genuine process: almost a scientific approach to beauty or artistic expression. By accurately defining the right questions, actively acknowledging influences all around us and utilizing them as points of origin, we can begin to excavate, reveal, and problem-solve… and enjoy the inevitable fruits of knowledge and the creation of a meaningful product through an honest, open, advancing process. The unfinished, potential nature of sketches, both compositional and visual, has always struck me as more appealing and satisfying than any finished, polished piece of music or work of art. 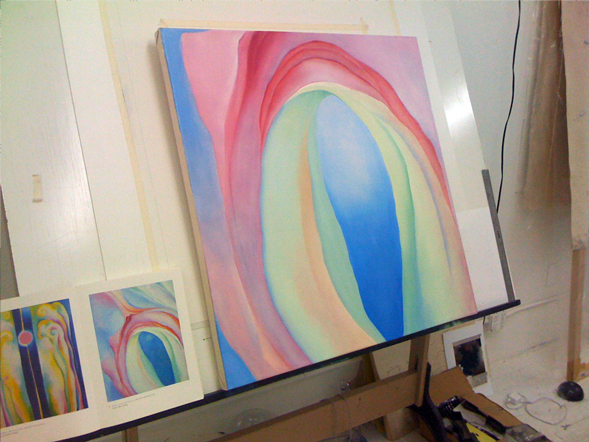 Still trying to define and articulate what makes that juxtaposition of finished and unfinished so beautiful - whether it’s simply joy in discovering that some fragment of process is revealed, or that potential always exists for another outcome, left to the imagination to complete.